Looking SE down line of water-pipe towards front corner of house. Just three volunteers on this sunny bank holiday Sunday. I was able to use my new homemade soil colour chart! I made it from Dulux colour swatches converted to the archaeologist’s standard Munsell colours using a free online colour converter. Munsell colour charts normally cost over the £100! The topsoil was Dulux’s Earth Glaze 1 or Munsell’s 10YR 4/4 – a mid-brown. Looking NW along line of water-pipe from NW end of house, towards site of NE corner of big barn. Last week’s new trench over an iron water pipe heading in the direction of a large barn in the farmyard was further excavated. Under the topsoil, fragments of brick, slate roof tile, and ceramic ridge tile indicates WW2 artillery debris from the barn and/or house, but the wall plaster fragment would have been from the house. 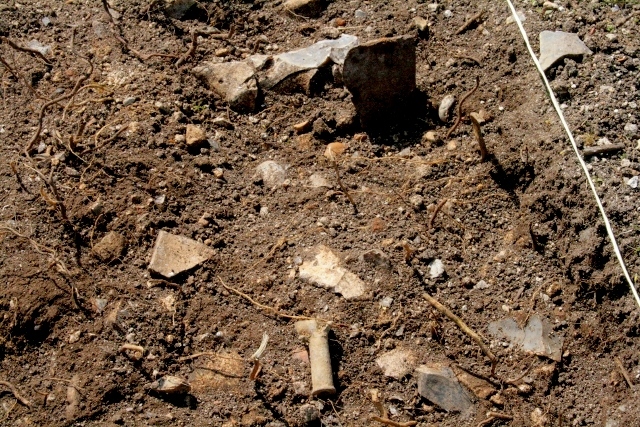 Some fragments of green bottle glass and white pottery found in this layer are therefore not dateable based on their context. To the north of the house, a 2x2m area of the garden/farmyard wall was also excavated, as yet, to just below the level of the topsoil. Another .303 rifle cartridge found was further evidence of military activity in the area. 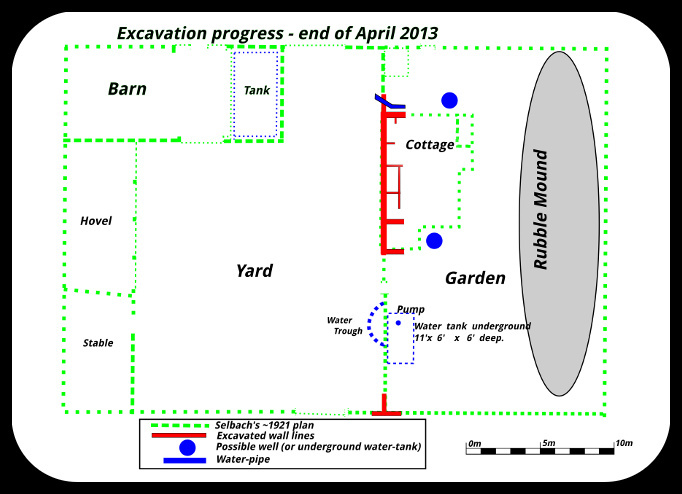 Excavation progress; End April. Base plan from ESRO. In the coming days, continuing northwards, it is hoped the location of the front boundary wall will soon be discovered. This will enable our only detailed site plan, from papers dating to 1921, to be checked for accuracy. 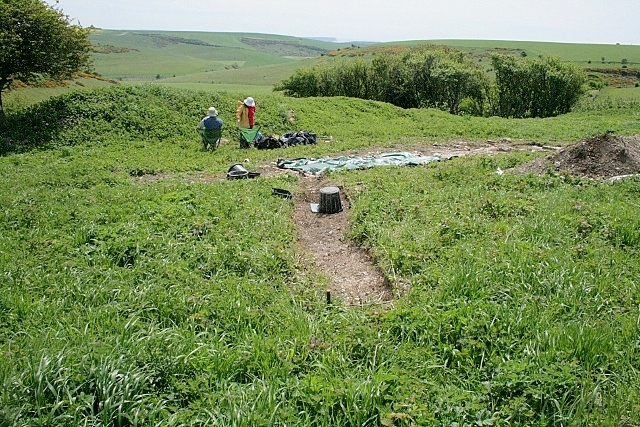 If it is we can confidently mark out the outline of the whole site on the ground. Meanwhile, the past few weeks of sunshine and showers has brought on a fresh growth of nettles, which will need regular cutting down if they are not to become too great a nuisance. 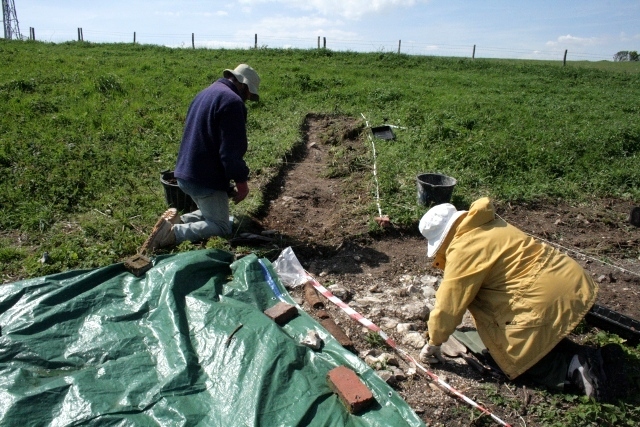 Visits from the interested public are an important part of the dig – they should not be limited to the intrepid and adventurous. And, of course, this very much applies to our diggers as well!